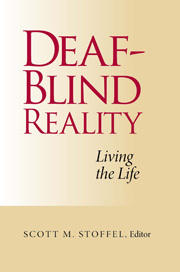 Deaf-Blind Reality: Living the Life explores what life is really like for persons with a combination of vision and hearing loss, and in a few cases, other disabilities as well. Editor Scott M. Stoffel presents extensive interviews with 12 deaf-blind individuals, including himself, who live around the world, from Missouri to New Zealand, Louisiana to South Africa, and Ohio to England. These contributors each describe their families’ reactions and the support they received; their experiences in school and entering adulthood; and how they coped with degeneration, ineffective treatments, and rehabilitation. Each discusses their personal education related to careers, relationships, and communication, including those with cochlear implants. Deaf-Blind Reality offers genuine understanding of the unspectacular but altogether daunting challenges of daily life for deaf-blind people. Scott M. Stoffel is a retired systems engineer and freelance writer in Lansdale, PA.